The March edition of the Battersea Polytechnic student magazine updated the Roll of Honour and also provided several pages of images of former students who were now serving with the Forces in some respect. The update to the Roll of Honour was a report of the death of James George Alexander Johnson, of Queenhithe. After leaving school – including some time in a German gymnasium – he had joined the paper makers Grosvenor, Chater & Co, and therefore did some of the Polytechnic’s courses in paper-making in 1912 and 1913. At the outbreak of war he joined the London Scottish regiment, and was killed near Ypres November 13th, 1914. His photograph is included in this issue of the magazine, alongside other students and former students who had joined up. The Polytechnic War Fund Committee had an update in the magazine, as reported here they were employing local women to make flannel shirts for soldiers. Subscriptions were dropping, as students were faced with increasing expense due to the war, and the shirt-making was currently costing more than the income of the fund. Despite this, the magazine reported that it was to continue until the end of February (the magazine coming out somewhat behind the times) and then the level of production was to drop to four shirts a week per woman rather than eight. This decision was partly motivated by the likelihood of more women needing additional work during the winter. The Committee also decided to stop supplying tobacco, as re ports suggested that men at the front were well supplied. A suggestion to supply chocolate instead was deferred until the next meeting. Regular events continued at the Polytechnic, with several pages of the magazine taken up with the report on the Annual Conversazione. This was a chance for students to display their work and for others to have a look round what had been happening across the Polytechnic. The report on the engineering workshops noted that “The work exhibited showed a high detail of accuracy, and much of it was done by students who are now serving in some capacity of other in His Majesty’s Forces, where we feel sure the same skill and thoroughness will be manifest in their military operations for the benefit of their King and Country”. The Physics department were demonstrating X-rays: “Many thought that the pale green fluorescence of the bulb was ‘the Rays’, although it was not produced by the ‘X’ Rays, but by reflected cathode rays. Our enquirer was quite disappointed when told that the X-Rays were not even visible”. The Domestic Science department was adapting to the war in its demonstrations – a number of the dishes represented were deliberately prepared without meat, and some of the cakes had been made without eggs. Methods of cooking whilst economising on fuel and utensils were also on display: “a complex dinner was cooked in a four-tiered steamer over one gas ring and another simple and economical meal was steamed entirely in jam jars which wer2 fitted into one large saucepan”. A Hay Box cooker was also being demonstrated, attracting a lot of attention. Domestic Science students were also mentioned in the magazine for their part in the war effort. Lucia Creighton was in Serbia, managing all the cookery at a Red Cross hospital with a staff of 26 people. It was noted this involved all the practical work as well as the management, her Red Cross details can be found online – although these are for later work. Monica Stanley had been with the Red Cross since the outbreak of war, first at Antwerp then Cherbourg. She was sailing for Serbia as well, where she was to be in charge of the catering at another Red Cross hospital. The magazine also carries the first instalment of Private George Wilson’s mobilisation diary, from 5th August to 14th October 1914. He was in the London Scottish regiment, and the diary was written up after he returned home wounded – although details of that are in the June issue of the magazine, so we’ll come back to his diary at a later date. We close the year with Battersea Polytechnic. This post has much of the background to the polytechnic, and they produced their own magazine which updated students on college activity and alumni information. The editorial for December 1914 comments that they would like to wish all their readers ‘“a Very Merry Christmas and a Happy and Prosperous New Year”. The first half of the greeting however, cannot, we feel, be realised in its entirety this year, as present condition are too serious for that.’ Having acknowledged that the war had not been over by Christmas, the editorial goes on to encourage all readers to do their duty to help their country. A War Fund had been set up, and the Art Department had contributed by holding an Art Exhibition, pointing out that artists are not generally “overburdened with this world’s goods” but determined nonetheless to be involved in the fundraising. The Ladies’ Sub-Committee was also very active, dealing with cases submitted by the Women’s Emergency Corps, Labour Bureaux and local clergy – they employed women workers and numbers employed had risen from 5 to 7. The women were employed to make army shirts – flannel had been purchased and the women made between 4 and 8 shirts a week. Cutting out the shirts was done by the staff and students of the Domestic Science Department, along with other willing helpers, each evening. The War Fund was also concerned over whether the care packages sent to troops should contain tobacco, or if small packets of tea would be equally acceptable – the balance was mainly in favour of tobacco. The magazine also carried a report on the Women’s Relief Corps, an organisation designed to help women to prepare to take up other duties which may be required of them later in the war. The Civil Section aimed to train women to take up men’s posts to release them for active service, whilst the Semi-Military Service had the added task of training women in some military drill. The report assures readers that the “nature of the training is in no way intended to encourage women to attempt to act as combatants”. 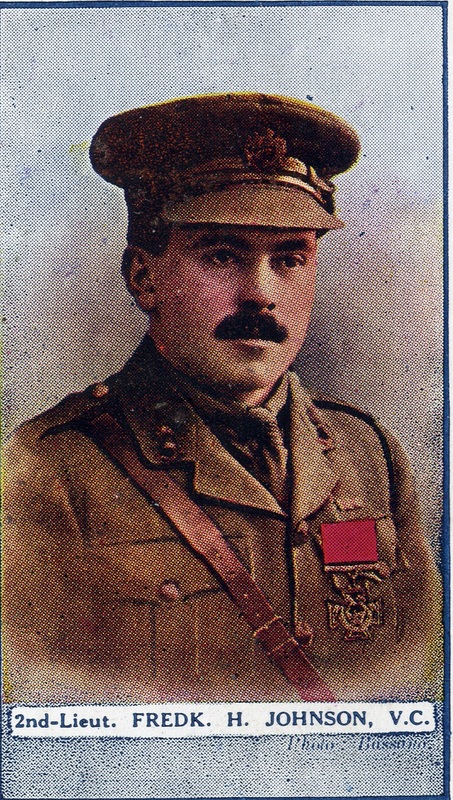 The previous issue of the magazine had carried a list of all staff and students currently serving in the Armed Forces, and the December issue contained an update – as well as a photograph of Frederick Johnson, who had graduated in summer 1914 and was a Second Lieutenant in the Royal Engineers. Later magazines contain photographs of other men connected with the Polytechnic. More routine aspects of Polytechnic life were not overlooked by the magazine, it carried reports of scholarships awarded, posts obtained by students – particularly those from the Domestic Science Department – and reports of society activities. The Engineering Society had visited the Osram lightbulb factory in Hammersmith and the LCC Tram repair works in Charlton. There were also reports of new books in the library and exam successes, so although the war was clearly having an effect on the life of students, some aspects very much carried on.